It’s been a couple of months since we announced the last Top Commentators Award i.e. July 2011. As I had alerted on DailyBlogging’s Facebook page that we won’t be announcing the award for August as I was out of town and hence failed to capture the screenshot of the Top Commentators Widget at the end of that month. So we allowed our July winners to continue for another month. Sorry for my mistake, will remember to setup an app to capture the site at the end of every month. Forget that, it’s a festive season & I hope you all are enjoying (enjoyed, I should say :P) Dussehra. So wish all your wishes come true this month. Have fun! Coming back to this month’s award, the banner slots go to Harry Sehgal Lennart Heleander and Colepath. Congratulations to both of you. Please send your 125*125 Banner Images as soon as possible using the Contact form. 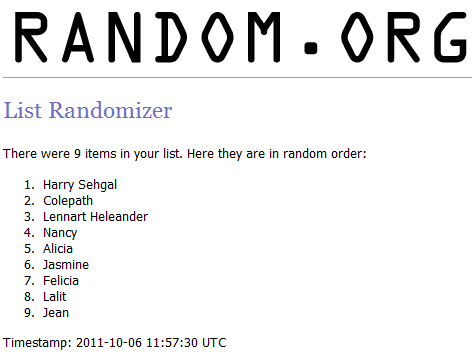 If you take a closer look at the List Randomizer result I’ve added only 9 usernames. That’s because one of our commentators has been disqualified for using only keywords in the name field. So that’s a caution for all those commentators who are using only keywords and thinking to get an easy backlink. There is no use guys, the comment will directly be trashed if I see such comments. To all other participants who took part in the race to the Top Commentators, hard luck people. Try again this month and I hope you win the banner slots. Sadly, Harry’s site was recently hacked and hence he asked me to give his award to the third person. So the Top Commentators Award goes to Lennart instead. Lastly, Subscribe to DailyBlogging’s Newsletters / RSS Feeds to get our updates right in your Inbox or your favorite RSS reader. How many comments did the winners have? Also, why did you choose the winners randomly? I don’t remember. Maybe near 10-12. From 2-3 months I’ve started to choose commentators randomly so that no one takes the advantage of commenting just to increase the comment count. Well then how is it “Top” commentators award? Top is never intended to the no. of comments. Yes, you are right technically it isn’t ‘Top’ Commentators Award. But Random Commentators Award sounded odd to me, hence didn’t change the name..
Congratulations to both of you, Harry Sehgal and Colepath. Everyone to look himself on the top but it’s not possible because at the end of the month only performance is count. So we should do only one thing we will try to work hard from our end then i think we will get an achievement. Congrats to Harry Sehgal and Colepath! Enjoyed reading most of your comments as well as everyone else on the top commentators list. Congratulations to both the winners. I like the banner prize with a random winner! Congratulations to the winners. I hope to be here on the list someday! Congratulations to the winners. I’m in 7th place, not bad! Thanks! Top commentators usually get the highest grade when it comes to link building, the exposure of their sites are more prioritize because of the presence of their links in their profile comments. Yes, Peter I agree with you. Congratulations to all the winners in the top commentator list. Great list on here. Are those commentators authentic?I mean are their comments not for back linking only? everyone did well to get this reward. Maybe I’ll be a part of this list next time, I’ll make it a point to comment more on your posts. How can I add my site to your top commentators?